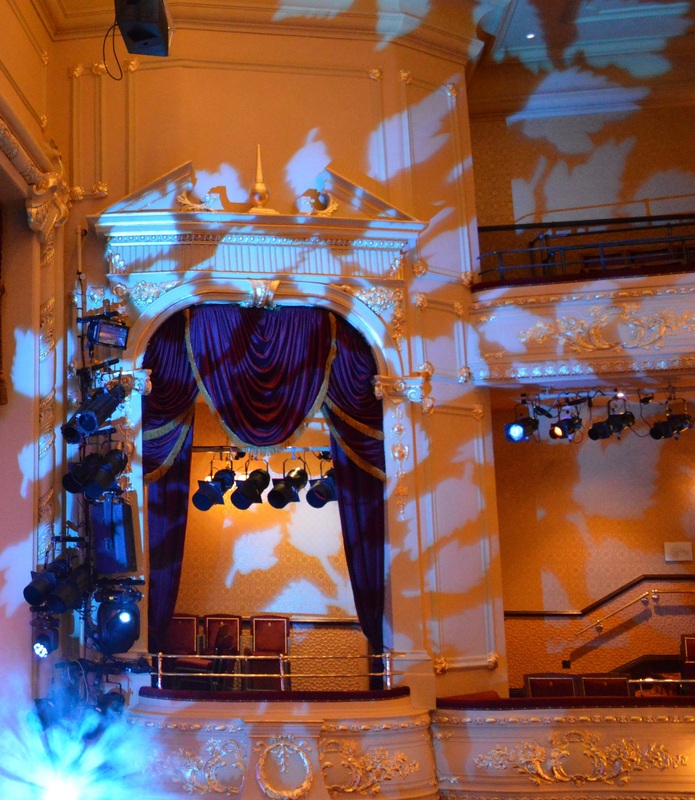 J&C Joel were instructed to design, manufacture and install a full drapery package for the newly refurbished Darlington Hippodrome. The brief was simple; to design, manufacture and install a set of opulent drapes, finished with complimentary trimmings, that would give the aesthetic of a bygone era. All drapes were manufactured from Red Lux Velour (SUN001) which meets the BS5867 Part 2 Type B flame retardancy standard. The Front of House curtain which measured 5.15m wide with a drop of 6.30m was finished with custom 400mm handwoven custom dyed woollen bullion which itself was headed with a 90mm custom braid with lurex thread woven in. Sitting 80mm above the braid was a 90mm deep Antique Gold (REG004) Regal Satin band. The Front of House pelmet was manufactured with a flat base on to which a central swag was sewn measuring 4.445m wide x 2.200m drop. This was flanked by two half swags each measuring 2.223m wide x 2.200m drop. The swags overlapped a custom 200mm deep handwoven gold wool bullion fringe headed with 45mm custom braid with the same lurex thread woven in as is found in the front of house drape braid. The pelmet had four runs of custom handwoven 25mm diameter two-tone rope, half gold and half aubergine with the aubergine element having the same lurex detail as the braid. Four custom designed rosettes were mounted at the top of the rope detail with a central rosette from which three fabric trumpets were hung. Each trumpet measured 1.00m with a diameter of 0.30m at the base. They were made from Lux Velour and finished with bullion and braid. Each rosette was then linked with swaged runs of rope. Each of the auditorium boxes had a self-lined (face fabric on both sides) five swag pelmet manufactured from Lux Velour. A central full swag and two half swags were manufactured and installed in parallel and then two outer swags were hung lower. All the swags were finished with custom 100mm bullion and braid with lurex detail. Each box had two self-lined fixed legs with 50% fullness and finished with tie backs made from the face fabric. We also refurbished rester rails for the Royal and Upper Circles, Auditorium and Rear Stalls Boxes. These was stripped back and rebuilt by the project joiner and then finished with 20mm high density foam and covering in Lux Velour. As a finishing touch, we produced and installed on the stage side of the rester rails, a custom 30mm braid in Aubergine which had a gold lurex detail woven throughout. 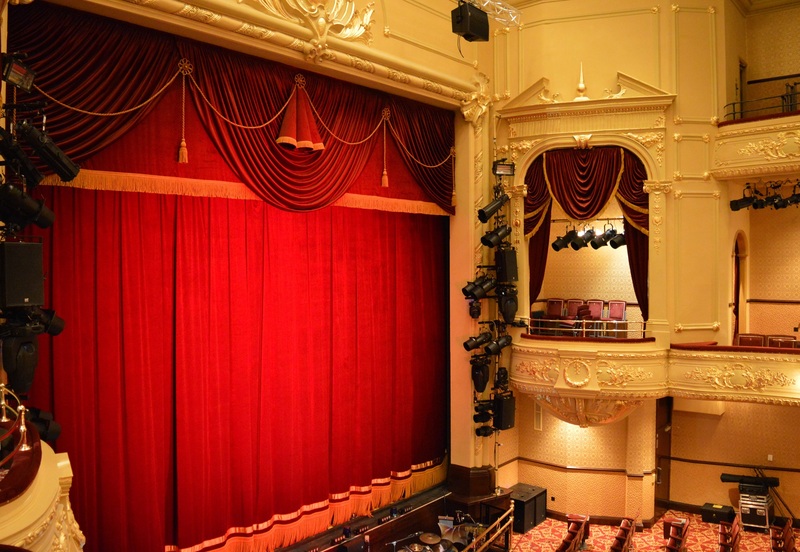 We also provided drapes for the archways leading to the auditorium boxes, rear stalls boxes, orchestra rail drapes, numerous door window drapes together with masking drapes. There were several challenges with this project. The primary challenge was to design and obtain approval for the drapes in an auditorium that was not yet complete. This meant crucial dimensional and fixing information was not available until late in the project resulting in a very intense manufacturing period. We overcame this challenge by producing a series of AutoCAD drawings together with renders to assist the client and leading Heritage Consultant David Willmore to visualise the end product. With the assistance of Willmott Dixon and the other subcontractors, these issues were overcome successfully. The next challenge was to ensure the fabric and materials used were in keeping with the refurbished auditorium. This meant creating old fashioned looking drapes and trimmings using modern materials. To achieve this, we had to employ some historic manufacturing techniques. As an example, the majority of the trimmings were handmade. A further challenge hovering over the project was the requirement to satisfy a Listed Building Consent Condition and Planning Permission Condition LBC9 (PP12) as a result of this being a heritage restoration. This required the production of detailed documents setting out the scope of work, materials used, and manufacturing methods employed. The CAD drawings and renders we had produced in the design phase together with the thorough documentation of the creation of the trimmings allowed this condition to be successfully discharged in advance of completion. Darlington Civic Theatre received a £4.5m grant from the Heritage Lottery Fund (HLF) to transform and regenerate the Grade II Listed building to its former glory. 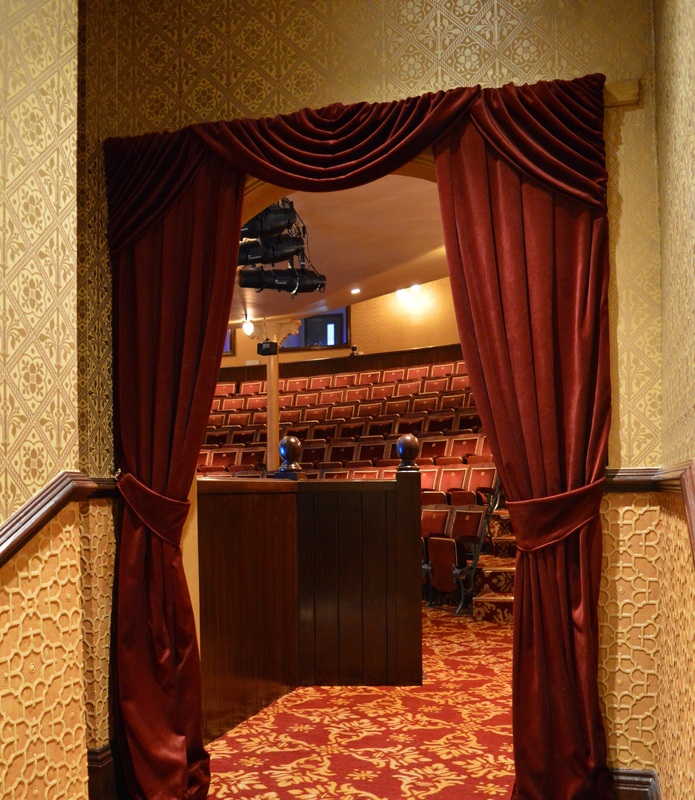 The grant formed a key part of a £11.3m project to restore the Edwardian theatre with 21st century facilities. 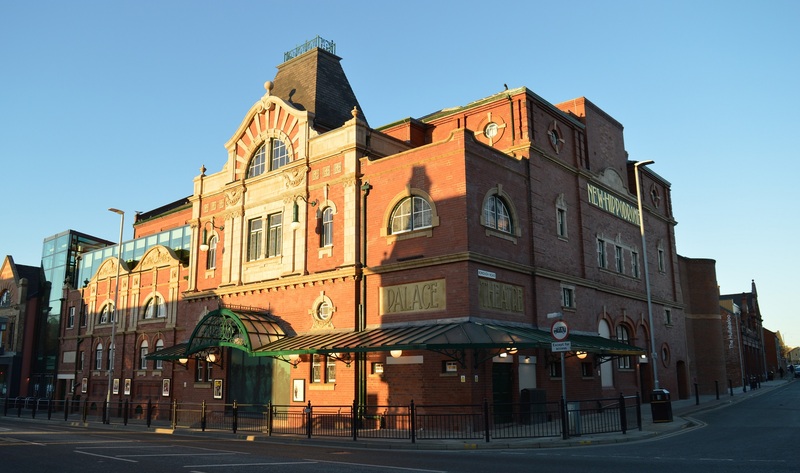 The theatre closed at the end of May 2016 to allow work to begin and reopened towards the end of 2017 with a new name – Darlington Hippodrome. The project included the restoration of the exterior of the theatre and the Edwardian auditorium, a new entrance and promenade gallery, the creation of a function room in the former water tower, as well as improved seating with more leg room and disabled access, including two lifts providing access to all levels both front and back of house. The restoration is a credit to all involved, in particular David Willmore and Willmott Dixon, and will be a huge asset to Darlington and the North East of England.